Since influencer marketing first made waves in 2015, it’s been one of the most popular social marketing methods for big and small brands alike. Whether you’ve already run a few campaigns or you’re thinking about getting your feet wet, you need to know how to run influencer campaigns effectively. Take a look at seven common influencer marketing mistakes and learn how your business can avoid them. If you’re new to influencer marketing, it’s easy to confuse influencers with celebrities. After all, both influencers and celebrities promote brands and encourage their followers to adjust their buying habits accordingly. So what’s the difference? While celebrities may be media stars, they tend to have diverse audiences with a wide variety of interests. Getting a celebrity endorsement may be exciting, but there’s a good chance that a fair share of the celebrity’s followers aren’t your target audience. In contrast, great influencers tend to have niches that may range from high-end fashion to natural cosmetics to allergy-free foods. Finding the right influencer for your brand means driving more sales and tapping into a targeted audience for your products and services. Like most aspects of marketing, influencer marketing is all about the numbers. Before you partner with an influencer, however, make sure you know which numbers really count. Remember that an audience size that numbers in the tens of thousands or even in the millions doesn’t necessarily indicate a quality influencer. Instead, audience engagement tends to be much more important. Naturally, you want your target audiences to like, comment, share, and click through to purchase your products and services. Merely seeing your brand in their news feed isn’t enough. When many marketers think of influencers, they automatically equate these relationships to paid promotions. While many influencers do charge for their work, especially for specific, targeted campaigns, not all influencer relationships have to begin with your company writing a big check. Rather than beginning with a pitch for a paid partnership, try building an organic relationship with potential influencers instead. Build a connection on social media or through the influencer’s blog, and consider sending free samples, with no strings attached. After all, it’s important for any influencer you work with to be able to promote your products or services in an authentic way. Many influencers will readily mention the brands they like to build their own authority and boost audience engagement. Whether you start out with a paid partnership or an organic affiliation, it’s almost always in your best interest to approach an influencer relationship as if you’re in it for the long run. After all, influencers are in the business of making authentic recommendations. If they don’t sense a real connection or if they can’t genuinely recommend your brand, they probably won’t. Developing a long-term relationship takes additional time and resources, but most marketers agree that it’s worth the extra investment. When you make a true, long-lasting connection with an influencer, you’re more likely to get more traction out of your relationship and even amplify your campaigns. In addition, partnering with the same handful of influencers again and again can help you streamline your workflow and focus on creating great content instead of wasting time on hashing out details with new influencers every time. If you’ve put your blood, sweat, and tears into building your brand, you might be inclined to tell influencers how to talk about your products and services or even demand to oversee their content creation process. While it’s common to outline your expectations and your content guidelines at the beginning of a partnership, it’s never a good idea to micromanage influencers. Keep in mind that trust is a key component of any successful influencer campaign. If you’ve chosen the right influencers for your brand, it’s essential to trust that they’ll effectively promote your products or services to their followers. It’s also important to understand that influencers won’t necessarily communicate in your brand voice. Instead, they’ll use their own unique voice and methods to connect with their audience. Not only do influencers have a wide range of rates depending on their experience and their niche, but many also offer multiple payment models. Most charge per blog or social media post or per campaign, but some may offer alternative payment models that better align with your goals for the campaign. If you want to drive engagement or get as many click-throughs as possible, inquire about a payment model that focuses on cost per click (CPC) or cost per engagement (CPE). If sales or subscriptions are your primary targets, consider offering influencers a commission model based on conversions. While establishing high-quality, long-lasting relationships with influencers can be great for your brand, you need to know what you’re actually gaining from your investment. It all starts with setting campaign goals. To do this, get together with your marketing team, determine what types of customers you want to connect with, and set appropriate goals for increasing brand awareness, driving sales, or encouraging customer loyalty. To analyze your return on investment (ROI), you’ll need to track the right metrics. For instance, if you want to increase brand awareness, you’ll want to track total reach and number of views. If you want to drive sales, you’ll want to track conversions and coupon code usage. With the appropriate metrics in hand, you can determine how effective your influencer marketing campaign has been and take appropriate steps to foster the relationship, revisit your marketing goals, or partner with a more effective influencer for your next campaign. 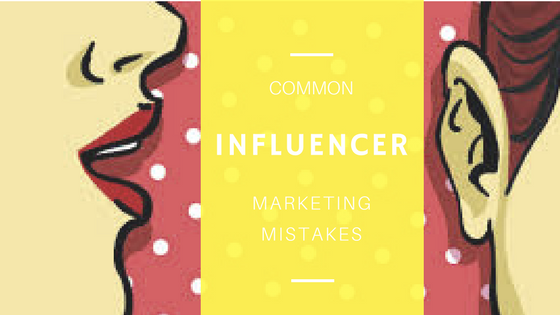 Now that you know how to avoid the most common influencer marketing mistakes, you’re ready to find the right partners for your brand and develop an effective campaign. With engaged, authentic influencers in your court, you have the potential to take your brand to a whole new level.